Description: The Zipper Sennit is related to the Chain Sennit and is based on the Slipknot. It's sometimes called the "Zippy Chain". It's made with a series of bights tucked into each other, using both halves of the cord. This decorative knot is suitable for a variety of uses, including jewelry, Macrame belts, handbag straps, and plant hanger designs. 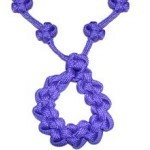 This knot is easy to tie, so can be used for projects involving children and beginners new to Macrame. 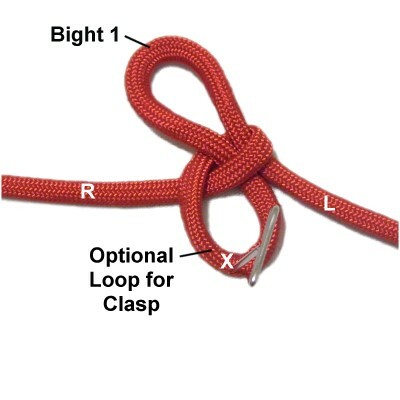 The Zigzag Pendant features this knotting technique, so is a good project to work on after practicing. 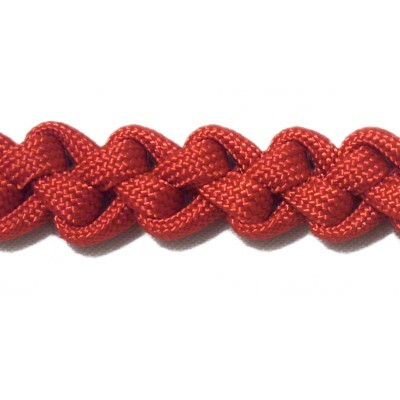 Paracord was used in the example shown, but you can make it with much finer materials like Hemp and Satin. Flexible leather looks interesting, too. Click on the link or image to view the page. 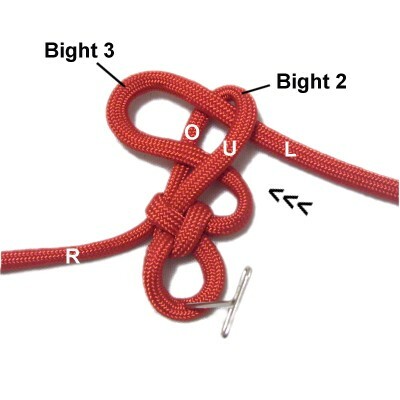 This knot is found on the Fusion Knots website. The video gallery contains many other interesting knotting techniques and designs. To practice, you need one cord at least 36 inches long. The cord should be at least 10 x the finished length of the item you are making, if you are using the Zipper Sennit for a project. Make the cord longer if you plan to tie a button knot, or want to decorate the ends with beads. 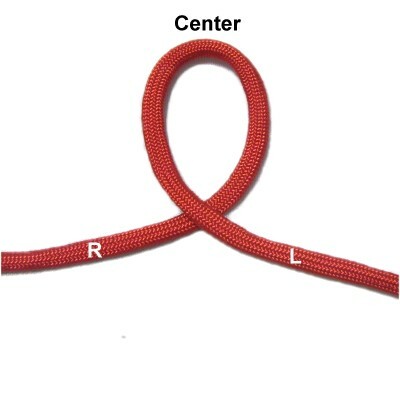 Step 1: Make a loop at the center of the cord, crossing left over right. 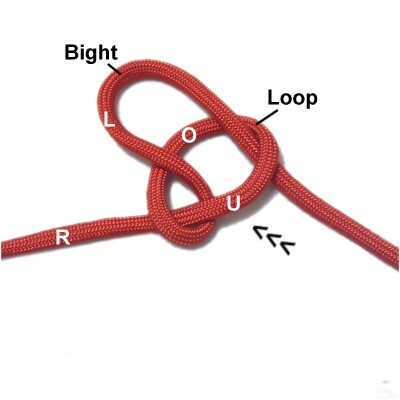 Push it into the loop under - over (from below), on a diagonal slant toward the left. Step 2: Pull the right half of the cord to tighten the first loop around the bight. Pull the left half of the cord to change the size of the bight if needed. Identify the segment marked with the X. 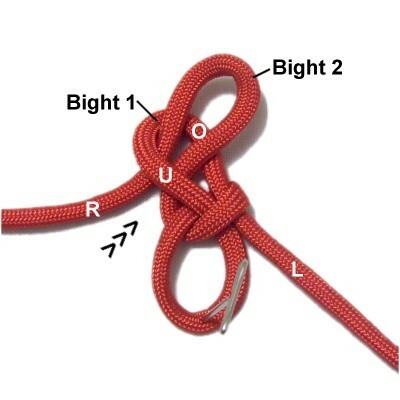 Make sure both halves of the cord are the same length, adjusting the knot as needed. Pull the marked segment until it's the right size for a clasp, if you need one (optional). 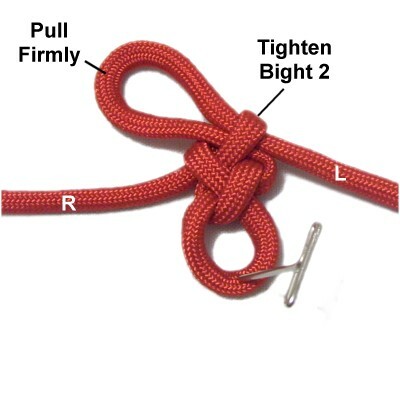 Step 3: Fold the right half of the cord to make the second bight. Pass it into bight 1 under - over (from below). It should be arranged diagonally toward the right. Step 4: Tighten bight 1 by pulling the left half of the cord. Pull bight 2 firmly, then adjust it's size by pulling the right half of the cord. 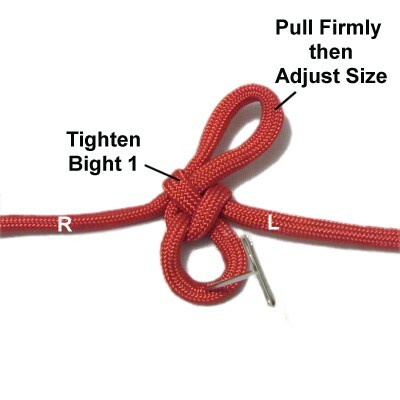 Step 5: Fold the left half of the cord to make the third bight. Pass it into bight 2 under - over, heading diagonally toward the left. Step 6: Tighten bight 2 by pulling the right half of the cord. 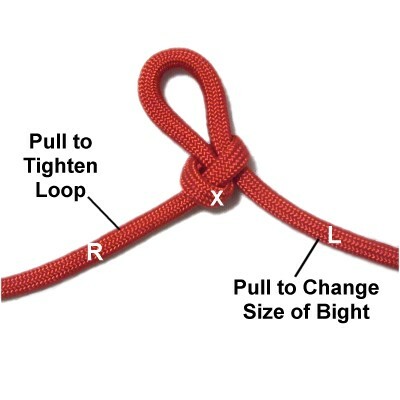 Pull bight 3 firmly, then adjust the size by pulling the left half of the cord. Step 7 : Repeat steps 3 - 6 several times, or until the Zipper Sennit is the length you need for your project. 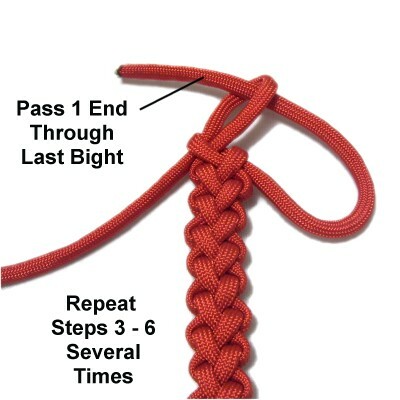 Finish by passing one half of the cord through the last bight (not another bight). The direction depends on where you stopped. Step 7, continued: Tighten the last bight as much as possible. Apply glue as you do so, if you are working on a project. The two ends can be decorated, or you can use them to tie a button knot if you need a clasp. Have any comments about the Zipper Sennit? Contact Me.